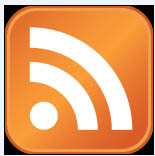 "The Independent Voice of Traditional Roman Catholicism since 1994"
What's New on the TRADITIO Network? The TRADITIO Network has now been furnishing information about all facets of traditional Roman Catholicism, answering questions both privately and publicly, for over 25 years now, longer than any other traditional site on the Internet. When we started, even the Vatican site didn't exist! We wish that we could show you all of the personal letters we have received from troubled souls who have found here clear, traditional, and honest answers to their questions. Thousands of these have reverted or converted to the traditional Roman Catholic Faith as a result. Our work has always been done free of charge, but at this time of year, we like to remind you, particularly if you have benefited personally from the TRADITIO Network, to remember to make a donation to TRADITIO as part of your almsgiving at this time of year. You may most easily make a donation to TRADITIO's work by using the convenient Make a Donation box on this page. It is most unfortunate that many traditional Catholics do not have access to the Solemn Rites of Holy Week and Easter in the fully-traditional rites before they were "modernized" in 1956. Even some of the so-called "traditional" groups scandalously use the "modernized" version instead of the traditional rites going back to the early Church. 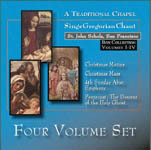 Fortunately, the St. John Schola has made available to the traditional Catholic faithful these significant rites on CD. 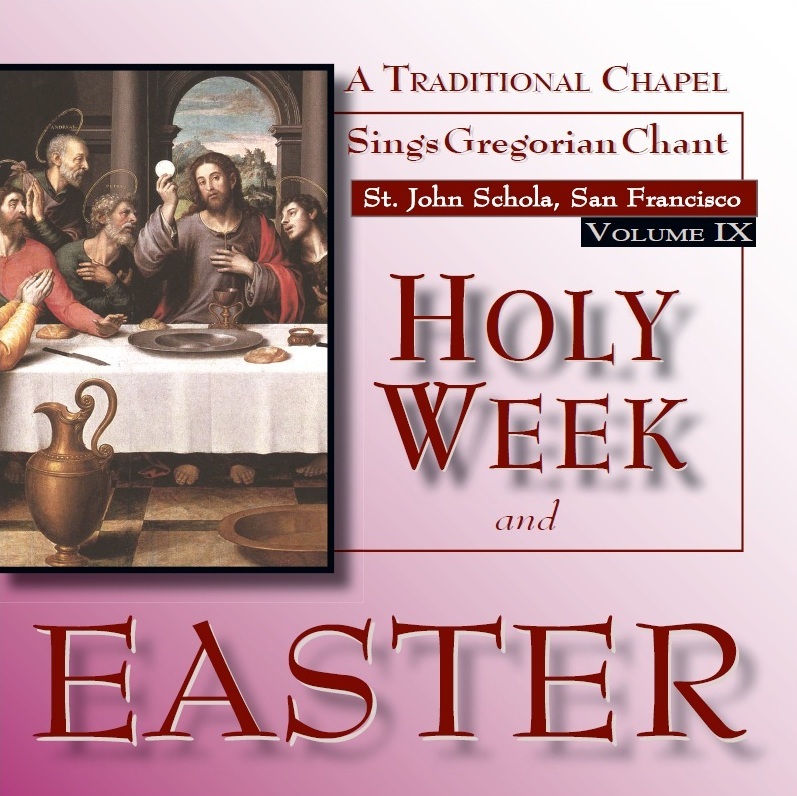 For further information, click on the TRADITIO Network's Gregorian Chant department for Volume IX of that Gregorian schola's recordings of Holy Week and Easter. 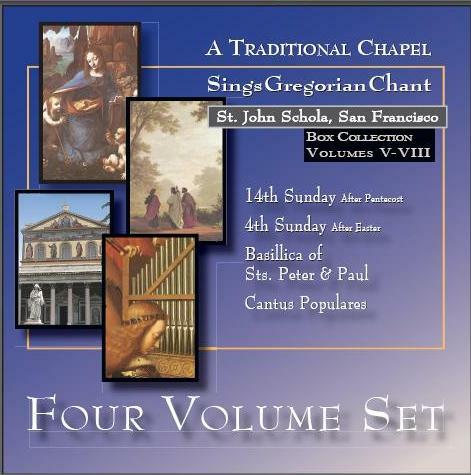 For you traditional Catholics who do not have the opportunity to attend these singular rites in person, at least you can participate in them spiritually through these recordings. Do not lose the opportunity. These rites are an essential part of your traditional Catholic Faith. These three days -- Maundy Thursday, Good Friday, and Holy Saturday -- are the most sacred in the entire liturgical year. For this 72-hour period, the Church, and we, meditate upon the truths most central to our Roman Catholic Faith: the Passion, Death, and Resurrection of Our Lord. 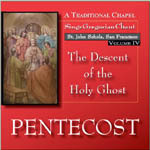 The drama of these days is transfixing as we hear the various Evangelists' versions of the treachery of the Church establishment (Annas, Caiphas, the Sanhedrin), the abandonment of Christ by the first pope (the three denials of Peter) and the Apostles, the Faith beginning to touch the Gentiles (Pontius Pilate, the centurion Longinus), and the small number who stood by Christ in the end (the Marys and St. John). 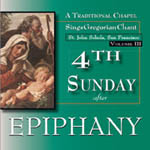 The liturgy of these days is the most ancient in the Church. Much is preserved from the very time of the Apostles, including the use of Greek in the Good Friday service. 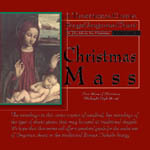 Up until a few hundred years ago, these were Holydays of Obligation, and no Catholic would think to miss them. Traditional Catholics should make even heroic efforts to be present at these solemn rites, in their Traditional Catholic Latin form, the ancient form that existed before 1956. 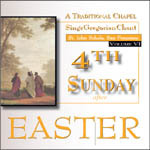 Those who do not have access to the traditional Latin rites should take ample time during this period to read the solemn rites in their missals, listen to the marvelous chant appointed for these days available on recordings, perform the Via Crucis, read the Passions in Scripture, review the Imitation of Christ, and engage in other such practices. Where every day the Fathers provide unique, provocative, often bitingly satirical commentary (after the Roman satirist Juvenal, St. Thomas More, and other Saints of the Church) from half a century's personal observation of the Church both pre- and post-Vatican II, on current events in the Catholic Church from the traditional perspective. Those who have paid the $10 Annual Use Fee for the current year's eBook Official Traditional Catholic Directory, Listing All Traditional Latin Masses and Traditional Resources for North America may update their copies to the CURRENT MONTHLY REVISED EDITION. We urge TRADITIO Network readers to buy and have on hand the current monthly revised edition of the Directory because we frequently refer our readers to it for traditional Mass locations and traditional resources, as well as the answers to many questions. This 200-page E-book, in the universal and free Adobe Acrobat PDF format, includes the only complete list, by sponsoring organization, of the approximately 700 Traditional Catholic Latin Masses in the pre-Vatican II Roman Rite, regularly and publicly celebrated in North America, as well as contacts for Mass sites outside North America. It also includes a list of traditional Catholic periodicals, suppliers, organizations, seminaries, religious orders, lay societies, retreats, schooling, and a necrology of traditional Catholic priests. 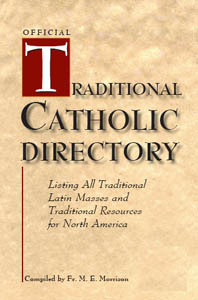 For further information, click on the Official Traditional Catholic Directory department, provided to the TRADITIO Network by the National Registry of Traditional Latin Masses. Those who have paid the Annual Use Fee to download the previous year's Original Edition and Monthly Revised Editions must pay the Annual Use Fee for the current year, if they wish to use the current year's Original Edition and Monthly Revised Editions. 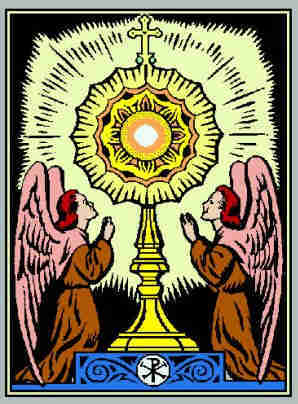 The most important prayer that the Church offers to Almighty God after the Holy Sacrifice of the Mass. Where the Saint, rank, and color of the day are listed, together with any fast and abstinence applicable. 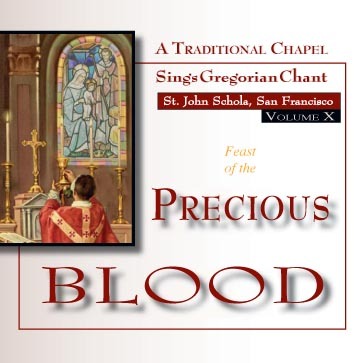 In addition to its CD series, the St. John Schola has provided to the TRADITIO Network chant clips with supporting music sheets and booklets, which can be downloaded free of charge. 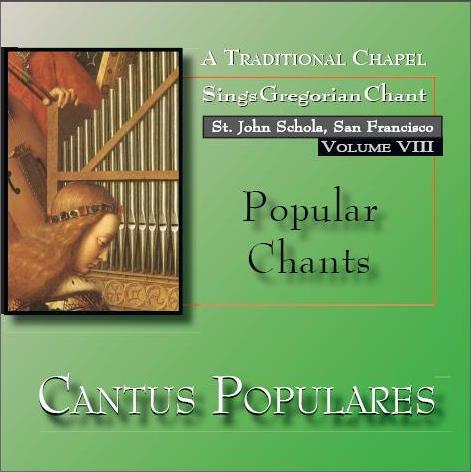 For further information, click on the TRADITIO Network's Gregorian Chant department. 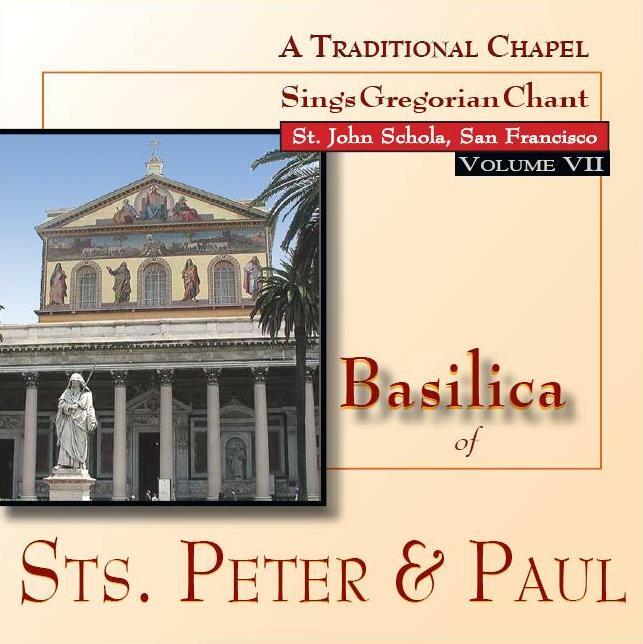 Where the TRADITIO Network continuously offers for sale in a "silent auction" traditional Catholic books and compact discs that are typically hard to find and not listed on auction sites. Advance notice of this sale has been sent to those on our booksale E-mail list. If you would like advance notification of booksale announcements, simply E-mail your name and E-mail address to TRADITIO. If you wish to support the TRADITIO Network's Apostolate, click on the box to the left to make a donation easily, securely, and confidentially by bank account or credit card through PayPal. Note in the PayPal message field: "Donation to the TRADITIO Network." Regular contributors become Benefactors of the TRADITIO Network, and their intentions are specially commemorated at Traditional Latin Masses offered. Using PayPal reduces our administrative burden considerably, but if need to use a paper check, click on FAQ01: How Can I Help the TRADITIO Network's Apostolate? Freefind is NOT associated with the TRADITIO Network. The TRADITIO Network was selected by Catholic Riverside as the Traditional Catholic Web Site of the Year for best "representing traditional Catholicism and displaying a great love for Jesus Christ." The TRADITIO Network was designated by the French traditional Catholic organization as "the English-speaking world's strongest site for Tradition." *The TRADITIO Network was determined by a statistical survey to be the most popular and longest-existing traditional Roman Catholic web site on the internet. The TRADITIO Network was selected by the Editors of the Encyclopædia Britannica as "one of the best on the internet when reviewed for quality, accuracy of content, presentation, and usability." The TRADITIO Network was selected to receive the Catholic Award as "a quality Catholic Web site and for outstanding efforts made in propagating the Catholic Faith." The criteria were Catholic content, overall quality, navigability, and design appeal. 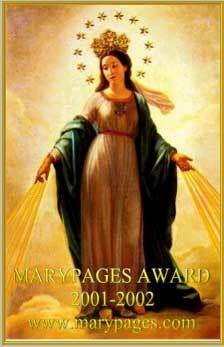 The TRADITIO Network was selected to receive the Mary Award from Holland as "a quality Catholic Web site of great Catholic thought that contains a great love for the Blessed Virgin Mary." If you have any questions, E-mail the TRADITIO Network. Copyright © 1994-2017. Publication of any material from this site without explicit written permission is strictly prohibited. References to the TRADITIO Network from external sites, or external advertisements that may appear below, do not necessarily indicate permission, approval, or even knowledge of such external sites or advertisements. 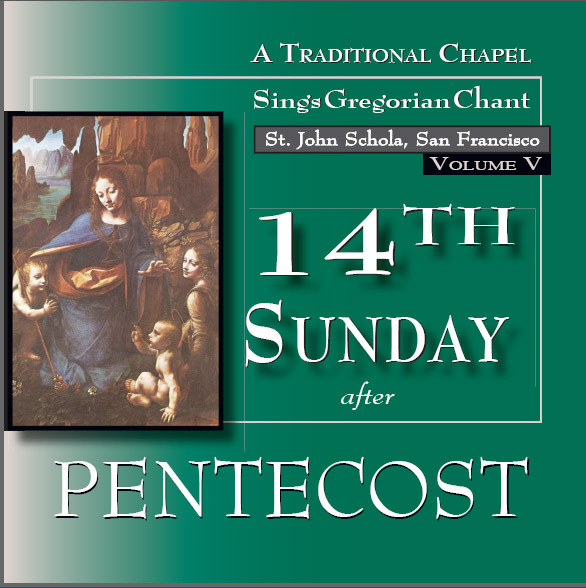 This site operates independently of any diocese, religious society, or other web site. Opinions are those of the respective authors only. The information and materials contained in this web site are provided "as is" without warranty of any kind, either express or implied, including without limitation any warranty of accuracy, adequacy, or completeness of the information and materials, title, non-infringement, merchantability, fitness for a particular purpose and freedom from computer viruses.